1. Why should I choose Sport Court of Massachusetts over the competition? We are right here in your community and backed by the Sport Court manufacturer’s promise. 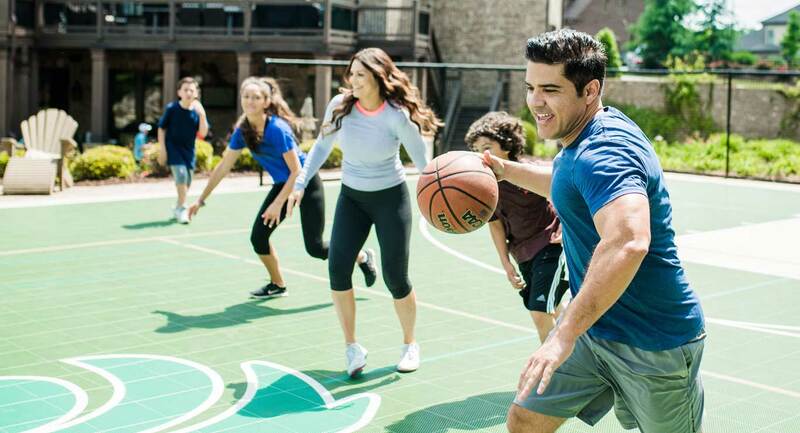 With over 1000 installations in Massachusetts and New Hampshire, we have the experience and track record to build you the right court to give your family years of fun. See what our customers are saying about us. We pride ourselves on our Sport Court-certified CourtBuilders™. Court construction is not a side job for us, so you can trust us to see your project through from start to finish. And with independent safety testing, we know this will be safe place for your family for years to come. 2. How much room do I need to fit a Sport Court game court in my yard? Sport Court game courts are custom-designed to fit the space in your yard. Almost any size or configuration is possible. Download our 10 tips for custom court building to help you understand the process. 3. How long does it take to install a game court and what are the building steps? We recommend planning on 4–6 weeks from the first time you meet with Sport Court of MA; until the day the court is ready to play on. 4. What does it cost to build a sport court game court? The cost of a Sport Court depends on various factors and there is no “one-size-fits-all” price. The size of the court, the components (basketball hoops, lights, rebounders, tennis nets, etc), accessories and the amount of site work needed are a few examples of variables that can affect price. Contact Us for a free at-home estimate that is customized to your specific needs. A detailed explanation of court building expenses can be found in our Understanding the Cost of a Backyard Court Blog. 5. Do you offer custom designs on game courts? Yes! Our process is all about creating your very own personalized, custom court especially for your family and your property. We specialize in building courts of all sizes- whether you plan to build a half-court for basketball or a full tennis court or something in-between. Include custom logos, court lighting for nighttime play, fencing, rebounders...the options are endless! A batting cage can be incorporated in the design, FourSquare or shuffleboard lines, and the court area can even be used for ice skating in the winter months. Browse our gallery for ideas and Contact Us for a free estimate! 6. What base material do you recommend for a court? We typically recommend building courts with a concrete pad as the base material. Concrete, when poured according to court specifications, provides the most stable, unchanging, long-term performance, especially in this part of the country. Crushed stone and aged asphalt are also options for court base material. 7. How long has Sport Court of Massachusetts been in business? We have been building quality game courts and backyard recreational facilities for over two decades, with 1,000 courts in MA and NH. You can be assured that we will be here to service your court for years to come. We’re rated A+ through BBB and have earned the “Best of Houzz” awards. No other company has been around longer or built as many courts, so you can be assured we will be here to service you for years to come. Check out what our customers are saying about us. 8. How do I maintain my Sport Court game court? This couldn’t be easier! A basic broom, leaf blower or hose can be used to keep the top surface clear of debris. Because water drains quickly through the open-grid design, your court is ready for play soon after cleaning or inclement weather. We recommend an annual inspection and cleaning and offer easy maintenance plans for all of our customers. For home gym owners, all you need is regular dust-mopping and an occasional deep cleaning from a wet mop. Please Contact us for more information. 9. What are the benefits of a Sport Court surface as opposed to playing on painted concrete or asphalt? This is about the safety of your children, and no other outdoor sports surface can deliver a better combination of shock absorption, ball response, traction, and playability than our PowerGame™ outdoor modular flooring. Sport Court’s patented surfacing products are custom engineered and backed by 40 years of court building experience. Please see Sport Court surface safety explained. Visit our Sport Court Product Page for the benefits of specific Sport Court products or contact us for more information. 10. If I relocate, can I take my court with me? Yes! Sport Court surfaces and components (basketball systems, lights, containment netting, etc.) are designed to be easily removed and re-installed at a new location. A great solution if you are on the move. SportBase is a portable, environmentally friendly base option that can replace the need for a new concrete pad at your new location. 11. With lot coverage issues, what base options do I have? Each town has different rules for building and one possible solution would be SportBase. SportBase™ is environmentally friendly, made from 100% recycled material and specifically created for use under a Game Court system and promotes water drainage. Using SportBase as a court base (instead of concrete) can often satisfy town guidelines regarding lot coverage. Check out our informational video about Sport Base. Another great feature is that if you relocate, SportBase can be picked up and moved along with your Sport Court game court tile and basketball hoops! 12. Is the surface slippery when wet? Almost any surface can be slippery when wet. However, Sport Court’s open-grid design sheds water quickly, making it possible to return to action sooner than any other surface. 13. Do I need a permit to build a backyard court? It depends on your neighborhood. We have experience in working with municipalities and neighborhoods to help you navigate the required regulations. 14. Is Sport Court of Massachusetts licensed and insured? Yes, we carry all the necessary insurance to keep our employees safe and protect you from any liability. 15. How long does a Court Last? Our modular sport floors are covered by a 15-year limited warranty, and we expect them to deliver playability, safety, and durability for even longer. With proper care and maintenance, courts can last up to 25 years and more. 16. Does Sport Court use hazardous chemicals or materials in its manufacturing process or installation? No. Sport Court products meet all safety standards and don’t contain hazardous chemicals. We are the first sports flooring manufacturer to implement and certify a quality manufacturing process through ISO certification and be a ZeroWaste company. As a ZeroWaste company, less than 1% of all waste is sent to a landfill. 1. Does Sport Court flooring require a climate-controlled building? 2. How do Sport Court of Massachusetts floors compare cost-wise to other alternatives? 3. How is Sport Court flooring affected by moisture? Sport Court surfaces are designed and manufactured to stand the test of time (and water)! Unlike wood and most synthetic floors, Sport Court’s modular systems are virtually unaffected by water, whether in vapor form emitting from concrete slabs or sub-surface, or even (in most circumstances) in case of flood or submersion. Many Sport Court surfaces have been used to retrofit other systems damaged by flooding (and where the possibility of future floods exist). The polypropylene used in our surface is impervious to water damage. 4. Does Sport Court use any hazardous chemicals or materials in its manufacturing processes or installation? No. Sport Court products meet all safety standards and contain no hazardous chemicals. Some paint and coatings require ventilation during application, but leave no harmful residues or compounds behind. In fact, Sport Court is the only ISO 14001 sports flooring manufacturer in the United States—the international standard for environmental controls. In addition, Sport Court is a ZeroWaste company with less than 1% of all waste sent to a landfill. 5. What makes Sport Court of Massachusetts surfaces different from others? There are many indoor flooring options available, but few offer the versatility and multi-purpose applications of Sport Court. We have a few competitors in the modular field, but the most they can claim is that ‘they’re like Sport Court’—none have the history of pioneering and creating safe, unique, playable and durable sports surfaces. And compared to wood and other synthetic sports floors, no other product delivers more for less, or can be used in as wide a variety of applications. 6. How long does it take to install a floor? 7. How long will a Sport Court floor last? Sport Court modular sports floors are covered by a 15-year limited warranty, and we expect them to deliver playability, safety, and durability for at least that long. 8. Does Sport Court flooring provide any safety benefits? Sport Court suspended surfaces are among the safest in the world. Our patented Lateral Forgiveness™ provides protection against the stresses on limbs and joints, and we can adjust the shock absorption values to almost any level desired. Check out our informational video on the engineering and design behind the safety of our flooring. 9. How well does the ball bounce compared to other basketball floors? Ball response is one of the performance characteristics governed and measured in the DIN standards, which are the acknowledged metrics for basketball floors. DIN-certified basketball floors must deliver at least 90% ball response, and Sport Court surfaces typically range between 93% and 100% ball response values. 10. How does maintenance compare with other sports floors? Sport Court modular surfaces are easily and inexpensively maintained compared to most other sports surfaces. Regular dust mopping and intermittent deeper cleaning with a mop or auto-scrubber are typically all that is required. Our High-Gloss™ floors, with a durable polyurethane coating, can be field maintained every three years by your local CourtBuilder, typically requiring one day of application and 3 to 4 days before active play. 11. Why do you call Sport Court floors ‘multi-purpose’ sports surfaces? 12. What colors do you offer? Sport Court modular sports floors can be produced in almost any color you desire. In addition to our standard palette of over 20 stock colors, we can also design to your color specifications, to match school or other desired color schemes. In addition, we can create unique logos and other designs to personalize your floor, or utilize different colored sections to help you establish your activity schemes and teaching curriculum.